Richard Feynman is a renown theoretical physicist (deceased 1988). He once said that if he had to summarize modern science in one sentence he would choose: "The world is made of atoms". 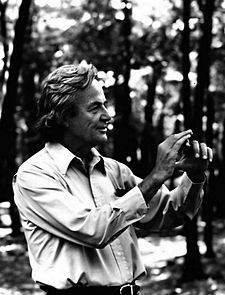 Brian Greene, also a theoretical physicist, has written of Feynman's choice: "When we recognize that so much of our understanding of the universe relies on the properties and interactions of atoms......we can well appreciate Feynman's choice for encapsulating our scientific legacy." And, there are other sentences. Many have said: "The business of business is business", meaning customers are swell, but shareholder value is better! Brian Greene: "The Fabric of the Cosmos"